I was down in Tampa this past weekend and what came across my eyes? A story about a new mobile book operation called Bluebird Books. Think of the old bookmobile meeting the food truck craze and you’ve got Bluebird Books. 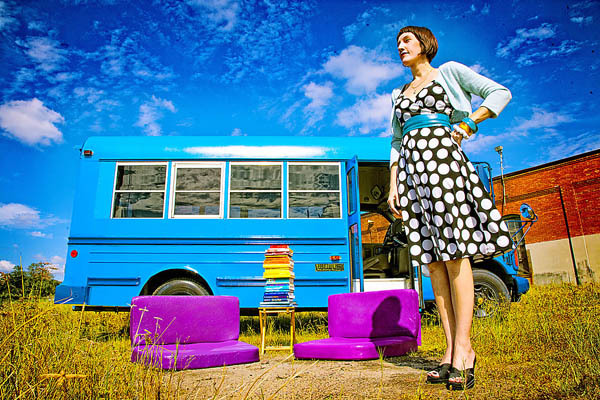 Mitzi Gordon, an artist and writer in the Tampa region, has transformed an old Bluebird Bus into a mobile bookstore. She’s building a “mobile station of inspiration.” The bookstore will house mostly art books and experimental fiction and will hit all the Tampa Bay hotspots. There are some really intriguing pics on her blog that detail the transformation of the old bus into a cool mobile reading lounge. Seems like an exceptional idea. Read more about Bluebird Books at this Creative Loafing article. Holy crap! Christopher was totally tossing this idea around in his mental salad bowl. Can I say that? Is that kosher? I want a Vouched Mobile roaming [prowling?] the streets looking for eager readers. Holy crap! Yes! This is exactly what I want to do! I need to get in touch with this lady! Phenomenal cosmic power! yeah, i almost emailed you about it before posting…it does seem like a natural fit for Vouched. I’m glad you didn’t. It was a great and awesome surprise to see this here. Great post, dude. I love supporting this stuff. That is so awesome! Love it. Right?! I’ve been freaking ecstatic about it. If you can, you should support their Kickstarter that’s going on right now! Even if you don’t have any cash to spare on a donation, spreading the word about it would be super helpful.